I have lived and worked in three National Parks since 1985 and started working in Antarctica in 2005. I continue to work in both places today. At present I am back at the South Pole Station for my third winter season. This time I am working in logistics as a Materialsperson. My job for this winter entails inventorying the station, which consist of the power plant, heavy equipment facility, our food supply, Maintenance facility, and our medical supplies. This will take a crew of three the entire winter to complete. We work in temperatures ranging from -30F to -100F during the winter months. My crew works in each stockroom listed above, some are indoors and some stockrooms are in the cold. I'll post pictures soon. Our internet connection is sporadic making it hard to connect during the day...work takes preference over the internet here at the South Pole. Of course Yellowstone is my first love- working in a National Park is very rewarding. Working in Antarctica is an adventure of a lifetime, the next new frontier...on earth that is! Terry has spent a couple of Antarctica summers at the Pole, and she's about to start her second WINTER there (that would be our summer in the US). The sun does not even show from March 21 to September 21 and it's always COLD. She has given us permission to publish the email reports she's sending from WAY down under and we thought we'd set up a space for her here to do that. It's dark and COLD down there. She'll be back on the ice in February. There will be no mail in or out until October, maybe early November. Can you say isolated? Terry spent some time in Montana in January, 2008, before heading back south. Look for updates in her blog below. They have Internet access 12 hours a day down there, when things line up with the satellites but, for now, we're going to pass things along from her. We'll see if we can get her engaged here a little later. For now anyway, you won't see any responses here to "friend" requests." "This photo is of the Amundsen-Scott South Pole Station taken every 15 minutes (if a relay satellite is available for transmission) from the roof of the National Science Foundation's Atmospheric Research Observatory which houses NOAA/ESRL's Clean Air Facility. In order to preserve the life of the camera, it is tilted down onto the snow when the sun is in the field of view, which occurs for several weeks around sunset (March) and sunrise (September) when the sun marches in a circle above the horizon. From mid-April until mid-August the moon and the aurora australis provide the only natural lighting." 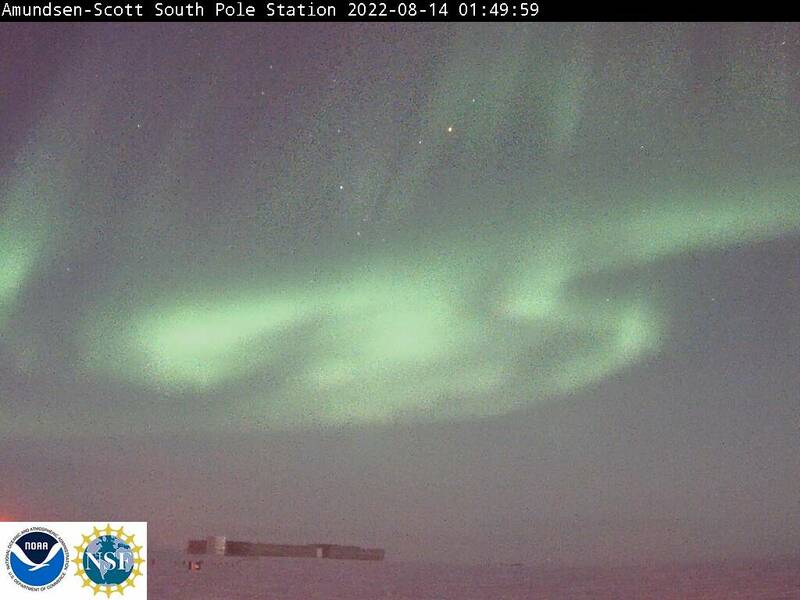 Life at South Pole is going well, with little over 10 weeks away from deploying>>>>. We are so excited to see light blue on the horizon which becomes further spread across the sky and brighter and each day getting closer to sunrise. The sun will be rising on Sept. 21. I ahve only worked at the South Pole, while McMurdo is a stop over to and fro South Pole I have never worked there. I have applied to McMurdo for next witner and would love to work at Palmer satation too some day. Kinda like Yellowstone... you just gotta work at every location! It is very similiar to the Yellowstone family I have known over the past twenty years. I would highly recomend doing it! I know it's not much details, I'm sorry... where do you work now Ned? have you been on any wild adventures? I was wondering if you could tell me some info about each of the three stations, what the are like facilities people ect. I'm really interested in going down there and working. HEY WHERE DO I SIGN UP. DO THEY NEED COOKS? Really great to see Zondra here.... thanx for spreading the word. Stay warm down there. Hello all, I'd like to thank Coolworks for updating my blog... Yes our internet/ satellite was cut back and it's hard to check messages, but it's Sunday and I have time. Everything looks great! If I was reading this it would incourage me to work here. If not given this position next winter I will defiantly check out CoolWorks job listings! Yeah Coolworks, you are the best company ever! Thanks for sharing my great new job experience. I'll be happy to answer any questions about the South Pole and my experience here. I'll be checking when I can and look forward to hearing from you all.